Although Chicago has no shortage of Italian restaurants, there is a lack in the Italian restaurant and bar fusion concept, a niche Otto Mezzo is seeking to fill. Open only Fridays and Saturdays from 5pm to 4am (5am on Saturdays), the bar isn&apos;t your typical airy Euro cafe. Instead, this late-night concept from Brandon Phillips and Kevin Hickey (both previously of The Duck Inn and Bottlefork), evokes a moody ambiance with its art deco accents. Adding to the ambiance, the availability of rare Italian liquor and craft beers makes Otto Mezzo is reminiscent of old Italian movies. The Fragola Fields Forever is a fan favorite cocktail. There is also a limited menu in case you need something to wash your liquor. Order the Ultimo Olives if you want something light but flavorful. 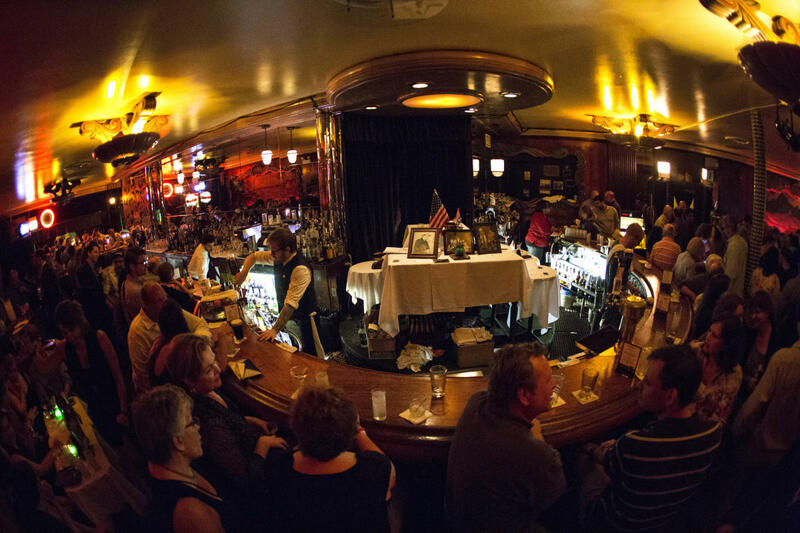 Arguably Chicago’s most popular piano bar, the Redhead Piano Bar is a great place to listen to music and grab a drink. Easily recognizable because of the famous logo, the upscale bar located on Ontario attracts clientele from all over Chicago. People drop by to try their martinis, of which the signature The Redhead is a favorite. The beer selection is limited, but they do have a good wine and spirits list. The bar is small and fills quickly, so if you want a seat near the piano, best to go there early. Also, note there is a dress code, which is strictly enforced. The bar is open daily from 7pm to 4am (and up to 5am on Saturdays). Chicago is known for its deep roots in jazz, and The Green Mill (a nod to Paris’s Moulin Rouge, meaning Red Mill) is a testament to that. With over 100 years in history, the Green Mill has hosted the likes of Frank Sinatra and Charlie Chaplin and has had jazz greats like Von Freeman and Kurt Elling play. In the 1920’s, the Green Mill was also a favorite hangout of Al Capone and his band of gangsters. The bar changed ownership over the years, but its current owner Dave Jemilo is responsible for restoring the bar back to its old days when he bought it in the 80s. Nowadays, the bar does not host gangsters, but patrons can sit at the same booth Capone did, a strategic seat which allowed him views of both the front and back of the room. The only thing Green Mill still does continue to do is play jazz shows, with both current and local greats that include the likes of Frank Catalano and Patricia Barber playing. The bar is open from 12pm to 4am everyday (5am on Saturdays). Which of Chicago’s late night bars are your favorite? Tweet your thoughts at @ChooseChicago, and we’ll share with our followers! Find more nightlife fun all across Chicago, from trendy cocktail dens to cool rooftops with views, we&apos;ve got top drinks and cool breweries.